There are no less than seven five former race winners in the entry, with 23 victories between them, and an impressive eleven drivers who have lapped the Mountain Course in excess of 110mph - and like their solo counterparts, the quality and strength in depth of the F2 class is obvious and further proof that The TT Races represent the best three-wheel races in the world. Heading the field once more, and at number 1 in the start list, is Dave Molyneux who took his 17th win last year, the third highest total in the history of the event. With an equally remarkable 28 podiums to his name, the Manxman has a new challenge this year as long time passenger Patrick Farrance has been replaced by Benjamin Binns, creating an all-Manx team at DMR. Molyneux has also switched engine supplier from Kawasaki to Suzuki but DMR will undoubtedly be the team to beat. Setting off ten seconds behind the Manx duo will be last year's Sure Sidecar Race One and overall winner Conrad Harrison who will again be partnered by Mike Aylott. With seven podiums in the last eight races, no one was more deserving of a race win and now firmly knocking on the door of 115mph+ laps, they have every chance of serving up a repeat of their 2014 exploits. They'll have two World Champions chasing them down in the shape of Ben and Tom Birchall and Tim Reeves and Patrick Farrance. They both took their maiden wins two years ago but while Reeves took another podium 12 months ago, with Gregory Cluze, the Birchall brothers will be looking to put 2014 behind them after they crashed spectacularly at the Black Dub. 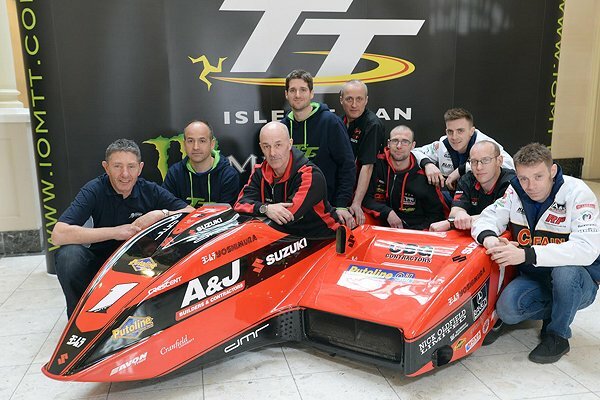 Reeves will be reunited with Farrance at the TT for the first time since 2009 and he will be hoping that this will see them back on the top step. A fifth race winner will be found at number five in the shape of the evergreen John Holden and Andy Winkle who showed they were still very much at the top of their game last year with two more hard fought podiums. Everyone knows there'll be in the mix again in 2015 and another race win cannot be ruled out. Ten seconds behind them is the consistent partnership of Gary Bryan and Jamie Winn and although 2014 saw the Lincolnshire driver post his first DNF since 2009, anyone who's lapped in excess of 112mph is sure to be a contender with and having taken no less then three fourth place finishes in previous years, a much coveted podium would be more than deserved. Karl Bennett and Lee Cain make it two Manx crews in the top ten at number seven and with their experience of the Mountain Course getting stronger year on year, the youngsters have every chance of bettering their fifth place finish and near 112mph lap of last year. There'll have to be at the top of their game though as the crew directly behind them is the father and son combination of Ian and Carl Bell. Ian made his return to the TT last year after an 11-year absence whilst Carl made his debut but a fourth place finish in Race One means that they will go into the event as yet another pairing capable of making it onto the podium. Rounding out the seeded drivers at numbers nine and ten are Wayne Lockey/Mark Sayers and Sean Hegarty/James Neave. Gloucestershire's Lockey took a career best sixth last year along with a maiden 110mph lap so can be expected to produce more of the same in this year's 3-lap races while the appearance of British F1 Champion Hegarty on the entry is a terrific fillip for all concerned. The Kent driver has just one TT appearance to his name, back in 1996, but he performed well then and with the experienced Neave in the chair, expect an extremely strong showing on his comeback to the roads on the Triumph powered Nick Crowe Racing machine. The next batch of ten sees yet more quality with former European Champion Gary Knight, another of the 110mph brigade, back after a year's absence along with Darren Hope/Paul Bumfrey (12), Rob Handcock/Aki Alto (14), Gordon Shand/Phil Hyde (15), Roy Hanks/Kevin Perry (16), Greg Lambert/Kenny Cole (17) last year's best newcomers Alan Founds/Tom Peters (18), the father and daughter pairing of Tony Baker/Fiona Baker-Milligan (19) and John Saunders/Robert Lunt (20), the last named the final driver on the entry to lap at more than 108mph. As expected, many of the class regulars are back in the running including Mike Cookson/Alun Thomas (21), Dean Banks/Ken Edwards (22), Howard Baker/Mike Killingsworth (23), Nicholas Dukes/William Moralee (24) and Mick Donovan/Aaron Galligan (25), the last named back after missing the 2014 event. Meanwhile, the field is again full of overseas talent with impressive Australian newcomer of 2014 Dwight Beare (26) back for more along with Michael Grabmuller/Manfred Wechselberger (28), Francois Leblond/Anne Garnish (32), Estelle Leblond/Sebastien Lavorel (35) and World Championship podium man Mike Roscher (34). Rapid newcomers from 2014 John and Jake Lowther return as does 1987 overall winner Kenny Howles whilst there are an impressive 12 newcomers set to make their Mountain Course debuts include the American pairing of Chris Wells/Jeff Gillard, French hillclimb champions Pascal Gassmann/Olivier Chabloz, Irish front runners Terry O'Reilly/Aidan Browne and Norwegian driver Geir Johnsen. All in all, 2015 should provide two hard fought and exciting three lap affairs in the fight for the victories and in the battle for places all the way through the field.